When I first visited Vienna with Monsieur le Chic we were impoverished backpackers so poor that we couldn’t actually afford to go round any of the museums or palaces. I remember peering wistfully through the park railings at Schoenbrunn Palace then turning round and going back the way we came on the Metro line. Fast forward quite a few years later and our first trip back since student days. We almost didn’t know where to start such is the magnitude of choice on offer. When you’ve only got 4 days it’s best to have an idea of your must see places and then see where the mood takes you after that. Since I love history the Hofburg was a must. For 11.50 Euros each you get admission to the Sisi Museum, the Kaiserappartements and the Silberkammer (Imperial Silver Collection) plus an audio guide which we thought was excellent value. Unfortunately like many museums you can’t take photos of many of the exhibits no doubt to encourage you to spend lots of money in the museum shop buying their guide books and souvenirs. However an exception to this rule is the Imperial Silver Collection and I happily snapped away. I had never seen such a huge collection of cutlery, porcelain and china all in one place and I have visited lots of museums and castles in my time. The opulence in which the Hapsburg Imperial families lived has to be seen to be believed. 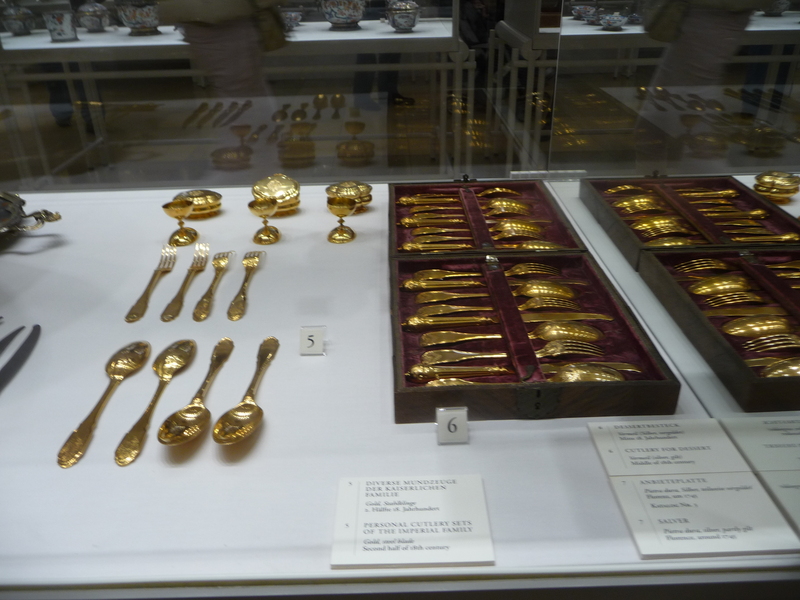 Maria Theresa even had her own set of gold cutlery. It must have taken the poor servants hours to wash, clean and polish it all! We wandered through room after room admiring beautiful chinaware and wonderful table decorations set as they would have been in the times of Imperial Banquets. A typical banquet would have had numerous courses not to mention the vast array of wines and liquor that would also be consumed. However most of this according to our audio guide would have been for show only to impress visiting dignitaries and such like – the waste of food must have been huge. The other 2 major exhibitions at the Hofburg are situated on the upper level and you pass through the “Sisi shop” en route to them. A word of warning don’t attempt to do what I did and wander back out into the courtyard with my audio guide still in my hand (I was trying to find the rest rooms!). This set off a cacophony of bells, whistles, alarms and suddenly worried security guards came running in my direction. It was extremely embarrassing (though Monsieur Le Chic thought it very funny) and I was politely directed back up the stairs where the toilet facilities are located. Undaunted after this faux pas we continued through the Sisi Museum which chronicles the story of the beautiful but troubled Empress Elisabeth (1837 to 1898) wife of Emperor Franz Josef 1. It is very well set out with beautiful exhibits including tours through her private apartments and wonderful replicas of her jewellery and clothing. Anyone who has an interest in fashion would find this interesting – her clothes were exquisite! It is a fascinating story though one has to conclude that “Sisi” was a tad “high maintenence”. In some ways she was ahead of her times. Her exercise room was a bit like an early gym with all sorts of apparatus as she was obsessive about her looks and maintaining her ultra slender figure. Equally interesting are the Imperial Apartments once occupied by her husband Franz Josef far more austere (relatively speaking) than those of his wife. It is a fascinating insight into a bygone era and well worth exploring. The Hofburg was the winter residence of the Imperial Family. Once Schoenbrunn Palace was built in the 18th century the court would go there for the summer months. We did manage to visit Schoenbrunn on this visit and to do it justice I will save it for another post. 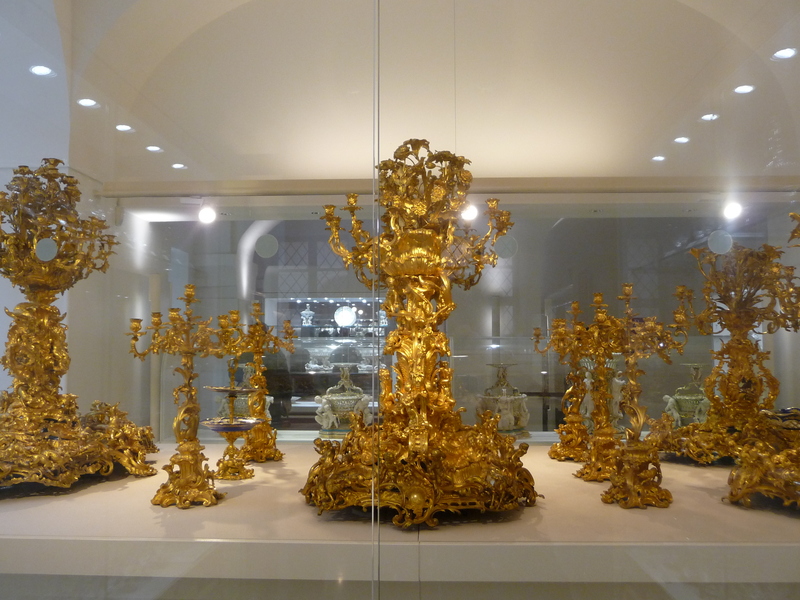 In the meantime some more photos of the Hapsburg silver collection! Wow! Incredible! It really was a different world and to think life at the Hofburg was fairly relaxed compared to Versailles – the mind reels! Thanks Natalie yes that’s what I’d always thought that the Hapsburgs were a bit more restrained compared to the Bourbons. There again Marie Antoinette was Maria Theresa’s daughter so perhaps she got some of her grand tastes from her mother! Have visited Versailles but only gone round the grounds I must go and see the interiors one day am sure it will be spectacular 🙂 Truly a different world!